Fortune's £1 million user interface, © Practical Computing January 1983Based in San Carlos, California, Fortune was founded as a start-up in October 1981 with $8.5 million dollars which, at about £24 million in 2019 terms, was possibly the largest seed investment ever made to a microcomputer company at the time. It quickly set to work spending its seed money, spending an alleged £1 million on adapting Unix and writing a user-friendly text-based shell around the unforgiving command-line interface that Unix provided. The end result, according to Practical Computing's January 1983 review did at least lead to a system that was "much more user-friendly than the average computer". The system was considered quite ahead of its time, with its 32-bit Motorola 68000 processor, support for up to 16 workstations plugged in to it via 4 x 4-port serial modules and its use of Unix and Ethernet, at a time when there were relatively few micros - the Sage II, Corvus Concept and Alpha Micro were pretty much the Fortune's only competition - that were ploughing the 16/32-bit furrow. Ethernet was first developed at Xerox PARC between 1973 and '74 by a team including Bob Metcalfe, although it wasn't launched commercially until 1980. By the end of the 1980s it had mostly sidelined other competing network technologies like IBM's Token Ring to become the de-facto networking standard and remains so to this day. 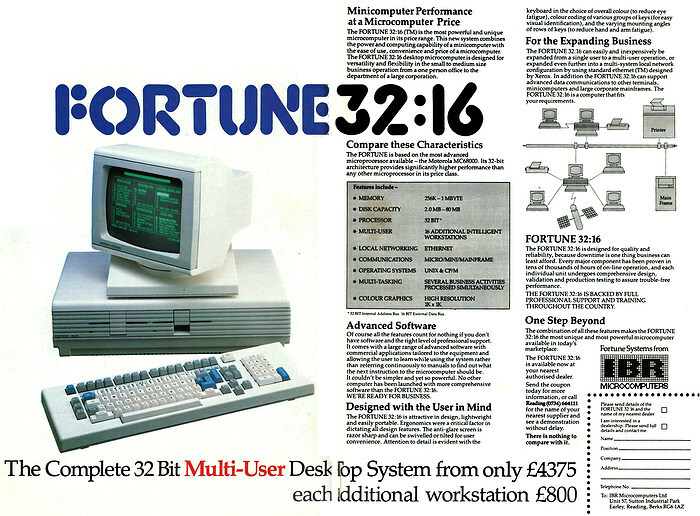 The Fortune 32:16 in use, © Practical Computing January 1983According to insiders within Fortune, the company's decision to focus on "Business BASIC", rather than Unix (presumably to counter the market unfamiliarity with the latter), was not popular with its engineers. 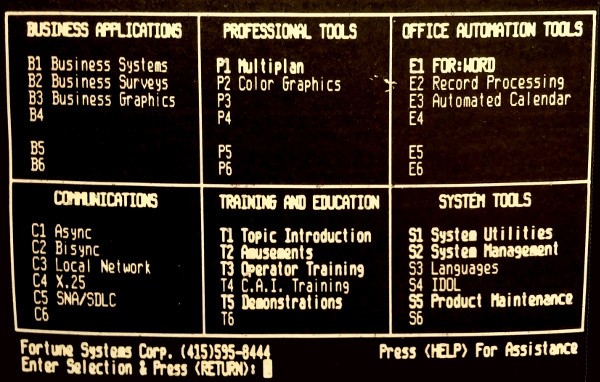 BASIC had been the lingua-franca of the home computer revolution but was seen as unsuitable for modern businesses, although the version of BASIC that shipped on the Fortune 32:16 was unusual in that it was so extended it could support several other BASIC dialects directly, such as TRS-80, Apple, Commodore and Microsoft. Instead, Scott McNealy's Sun Microsystems ended up eating the Unix workstation market, as well as many of Fortune's technical staff. There's no mention of how well the machine sold, although employee anecdotal evidence suggests it did quite well. That was despite its price, which started from £4,375 for the entry-level unit - nearly £15,900 in 2019 money - plus £800 (£2,920) per extra terminal. 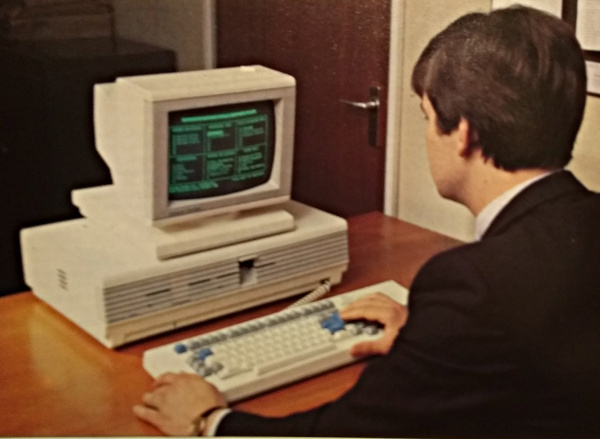 By August 1983, resellers such as IBR Microcomputers in the UK were cutting the cost of the machines in order to get "business executives" interested in multi-user systems. IBR dropped the price of the 5MB system (which would support 5 users) from £5,995 (£20,100 in 2019) to £3,995 (£13,400) - a saving of about 33%. Perhaps the strategy even worked - Fortune appears to have still been in business up to at least 1990, although it did announce a loss for the second quarter of 1983, which it attributed to a drop in orders and delays in software shipments.